This is an update of some of the posts I’ve written in the past about getting parents involved in blogging. 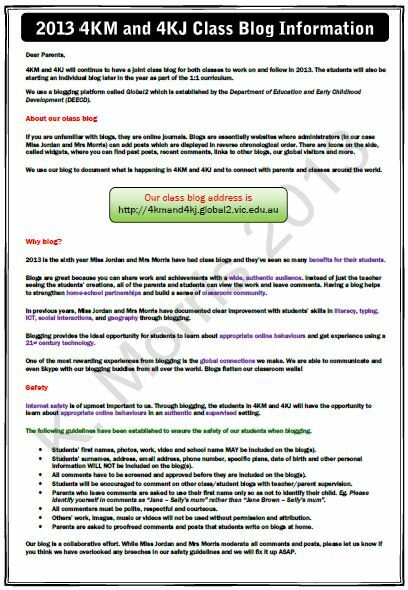 A class blog can provide a virtual window into the classroom. After having a class blog for many years, I have found that most families enjoy being able to keep up with classroom events and student learning. Unfortunately, I have seen a number of teachers almost give up on their class blog because of the lack of parent participation and comments. I often get asked how we get parents involved in our blogging community. Our parents are no different to those in other classes. They are busy people who need education, encouragement and ongoing invitations to participate. I have certainly discovered that you cannot leave parent participation to chance. At the start of each year when I introduce my class to blogging, there are always many students and parents who don’t know anything about blogs. I spend lot of the time at the start of the year helping my students learn about blogging, however, I have also come up with ways to educate the parents. This is very important. Parents won’t be willing or able to get involved in blogging if they don’t know anything about it. As Linda Yollis says, everything is more powerful when parents are involved in their child’s learning so I definitely like to encourage parent participation in blogging. Like students, parents have different learning preferences and I like to offer my parents a range of different means in which they can learn about blogging. On the first day of the school year I send home a blog permission note along with an information note. You can find the PDF of both documents below. A guide to navigating your class blog is even something students could create themselves. 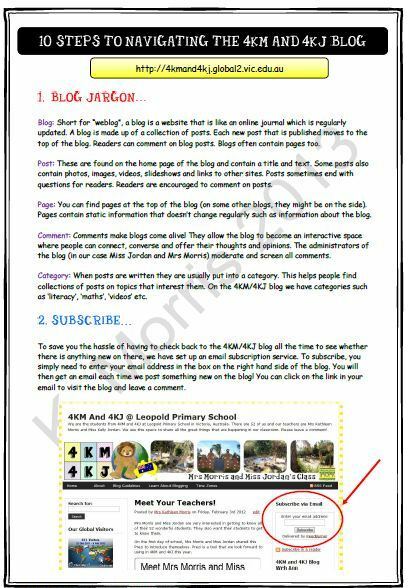 I have created a “learn about blogging” set of pages on our class blog. This explains to readers (including parents) what a blog is, why we blog and how to comment. For parents who prefer a more visual description, I have created a video explaining how to comment. Here are some other ideas we’ve used to educate and encourage parents to become part of our blogging community. Parent Information Evening: When we have held these in the past, blogging is one of the areas we have covered. Family Blogging Afternoon: We have held a couple of these events where family members are invited into the classroom to learn about blogging. Find our 2012 example on our class blog here. Family Blogging Month: This is an idea that Linda Yollis created for her class. We have borrowed her idea many times as a way to encourage family participation in blogging. Family Blogging Month is basically a competition where students try to get as many family members as possible to comment on the class blog. See our 2012 example which resulted in around 800 comments for the month of May here. Email Subscription: It’s important to have an email subscription on your blog and make sure your students/parents know how to sign up. That way they will be notified when new posts are published. Fortnightly Parent Emails: We send fortnightly newsletters to all our parents. This is a great way to offer blogging news or tips (amongst other classroom news and reminders). You can also thank the parents who have been commenting and invite parents to comment on particular posts. Posts for Parents: Sometimes we write posts with questions for parents. Here is one post we published last year that was specifically designed for parents. This idea was originally inspired by Henrietta Miller. Virtual Volunteers: Linda Yollis has come up with the idea of calling on parents to be virtual volunteers on a roster basis. Rather than helping students in the classroom, they can assist online by replying to students and engaging in conversations. I always try to reply to comments or have students reply. Of course this is not always possible but we do it as much as we can. It is good blogging etiquette to reply and provides an example to students that comments are not just one-way; they are used to generate conversation and discussion. A great deal of learning can occur when conversations are developed. Parents may not be encouraged to keep commenting if they don’t feel their comments are being valued or acknowledged. Want to use these ideas or modify my notes and handouts for your classroom use? Go ahead, I have included a CC-BY-NC license for the PDF files. Simply credit me as the original author and link back. Plan to share this post with teachers in my grad courses, who are just starting to create classroom blogs. Excellent and thorough advice. Wow! Such a wealth of information here! I plan to use many of your ideas to increase parent involvement on our blog. I really like the idea of a parent volunteer leaving comments. I have so many parents wanting to come in or help out and this would be perfect! Thanks for getting in touch. Good luck implementing some of these ideas in the classroom! Great advice here! Parents need to know what we are actually talking about when we have students blogging. I think the time and effort you take to inform parents about its value, as well as how to do it, is what stands out in this post. I know after reading this I have to go back and consider how effectively I have done just that. Having several ways for parents to be involved is a good idea. I have a feeling that more of my parents would respond to the idea of a roster which organizes their participation. I’d like to try Linda’s idea of a roster. She has so many wonderful ideas as you would have gathered from the post. This is a great post. One of the things I love about engaging with technology in the classroom is that things are always changing and developing. It is great that you have formalised here so many things that we as teachers are now beginning to do as part of our yearly routines. Thanks for the comment! Things certainly do change and develop quite quickly. I hope these resources help out a few teachers! As a 4th year education student, I am so inspired by tools such as this. I am also a parent and have strong views on teacher-parent communication. Your site has given me so many ideas for my future class room. That’s great to hear. Good luck with your studies! Thank you for such fantastic information on classroom blogging. I have just returned to work after 19 months maternity and study leave and this is the first year that I have had a classroom blog. We will be having a blogging afternoon in the near future, but next Tuesday, at the Meet the Teacher evening, one of my students will be walking the parents briefly through the blog. Everything that I have seen on your blogs has been inspirational and I only hope that mine is half as successful as yours is. Thanks for your kind words! It must be hard to get back into the swing of things after maternity/study leave. I’m sure you and your students will love blogging and get a lot out of it! Thanks Kathleen – this was shared on Twitter and is so timely! We’ve been trying to get blogs going and I’m going to make it my goal to mentor all our teachers – with help of course! The advice and documents are just what I need. Thanks from Rotorua New Zealand! I’m so glad the advice and documents is useful to you! Good luck with the blogging and mentoring. Wow, Kathleen, what a great resource. Thank you so much for sharing with everyone. The work you do is amazing. You are a true inspiration! Thanks, Sylvia! You’re too kind. I am seeing how blogging in the classroom can be very benefinacial. Thanks for the insight! Hi, I love the tips and would like to link to this on my site (bloggingcpd.weebly.com) I love the blog posts specifically for parents idea. Feel free to include the tips with attribution to my site. Thanks for asking! My name is Tiffany Wake, I am a junior at the University of South Alabama in Mobile, AL. I am an elementary education major and am currently finishing up my core classes before candidacy. One class I am enrolled in is educational media 310, which requires we blog and comment on others blogs as well. I wanted to give a little information about myself before I began posting, as I was assigned to your blog for the next few weeks. My classes also require some field service, and the teacher I shadow happens to have a class blog just as you suggest. I have seen the students use it, and I believe it to be very successful. Like you, the teacher sent out information on the blog, and how to use it so parents can be on board and more involved. I believe students should continue to learn at home so having the parents connected through the blog is huge help. Thank you for the advice and links. I will be sure to share them with my teacher! What a fantastic read! This seems like such a fun way in order to engage parents. As an arts teacher, I struggle with parent engagement and building my arts program (2nd year teaching). I was especially intrigued by the idea of parents needing to have their comments be validated. I would have never thought of this reciprocal effect. Were there any initial roadblocks or was there any resistance initially with parents? I am so impressed the way parents can be involved in class blogging as way of keeping in touch with their children and teachers at school.